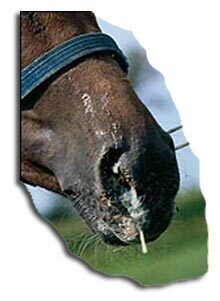 Once infected with strangles your horse will appear depressed, dull and will stop eating. The strangles bacterium enters the horse’s lymph glands through the respiratory tract and often rests in the guttural pouch. The lymph nodes can eventually swell, rupture and spread the strangles bacteria into the surrounding area. As a horse owner, knowing what to look for or how to spot the symptoms is crucial to your horses welfare. If left untreated the lymph node abscesses will usually burst and drain but in extreme cases the abscess can become so large they can crush the windpipe and result in strangulation of the horse. A nasal discharge appears and is initially clear but then becomes purulent (thick with signs of pus), after the abscesses have ruptured in the nasal passages. Abscesses that rupture shed highly infective pus into the environment, which can infect other horses. Which describes the spread of infection to unusual sites within the body other than the lymph nodes draining the throat. For example; abdominal or lung lymph nodes may develop abscesses and rupture, sometimes weeks or longer after the infection seems to have resolved. A brain abscess may rupture causing sudden death or a retropharyngeal lymph node abscess may burst in the throat and the pus will be inhaled into the lung. 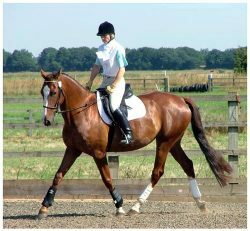 Inflammation of heart muscle, which may follow strangles in a small proportion of horses. An electrocardiogram (ECG) can determine that a horse can return to heavy work or to training after an episode of strangles. Inflammation of the subcutaneous tissue, which is an unusual occurrence where infection spreads locally in the subcutaneous tissue to the head. Apart from the problem of long-term guttural pouch carriers, recovered horses may shed Strep equi from their nose and in their saliva for up to 6 weeks following infection. All horses that have been infected with equine strangles should be isolated from other susceptible animals for a minimum of 6 weeks following infection. nodes. 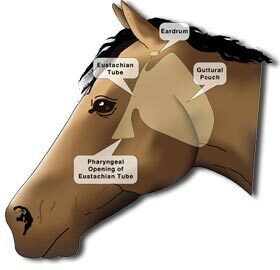 (see equine respiratory system). Low red blood cell count, during the convalescent period because of immune-mediated lysis of red blood cells. Filled with pus, which may be concurrent with classic strangles, or follow in the immediate convalescent period. The two guttural pouches are large mucous sacs; each is a ventral diverticulum of the Eustachian tube. They are present only in Equidae and are situated between the base of the cranium dorsally and the pharynx ventrally. They open into the nasal pharynx and each has a capacity of about 300 mL. Persistent infection in the guttural pouch may lead to inspissation (drying) of pus and, in some cases, the formation of a solid, stone-like, concretion called a chondroid. Horses’ that develop a persistent infection of the guttural pouches become the carriers, the major source of infection to spark outbreaks in susceptible horses with which they mix. The strangles bacterium enters the lymph glands via the respiratory tract and can find harbour in the guttural pouch. The lymph nodes swell and can rupture, shedding the bacteria into the environment. NOTE: It is thought that the equine strangles bacteria can survive in water for at least four weeks, and for up to eight weeks on tack or wood.